How to Get Organised With a Lifebook! I recently bought the ProductiveMuslim.com certified Lifebook from simplyislam.com and thought I would share with you my initial thoughts on it.It’s published by Siratt and is unique, as they have added an Islamic twist to the normal diary that is so readily available. Firstly, it is gorgeous to hold. I’ve bought a white deskbook, which is the larger version with a higher price tag. They also have a smaller pocketbook – a condensed version, smaller and slightly more wallet-friendly. It comes in an assortment of great colours. The white one that I have chosen looks so elegant. It also has good binding and thick, strong pages, which reflects the price of the diary. The deskbook is quite bulky but the pocketbook has less content, so if you are carrying a rucksack or briefcase or huge handbag (ladies!) everyday, then the size of the deskbook shouldn’t be too much of a problem. So this year, Siratt have teamed up with ProductiveMuslim. 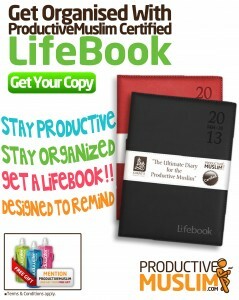 As you can imagine, having bought a Lifebook before and being such a huge fan of Productive Muslim, I jumped at the fact that they had collaborated for this year’s Lifebook. Productive Muslim’s input is all about the content. In addition to the usual articles by Siratt (I’ll describe a little later), Productive Muslim have revamped the actual diary portion of the Lifebook. Of their input, what stands out the most has to be the My Habit List section which appears at the beginning of every month. It inspires you to think about realisitic, productive habits that you want to develop and forces you to face all of the nasty habits that equal procrastination and lack of results. If you truly want to make a change, this is a pretty way to tabulate the progress you are making! Win-win! One of the main reasons I love buying Lifebooks is the short articles on a huge range of topics before the diary begins. If you are planning to use this everyday, these serve as helpful reminders that leave a deep message.. and they are available to you all the time! Some of the topics include “The Wandering of the Heart”, ie. our heart reflects ourselves and becomes healthy or sick depending on our character and actions; “Prayer – Significance and Benefit” and “Repent – Before the Death-Rattle”; all of which are extremely relevant to us as Muslims leading busy lives. Furthermore, there are hadiths and verses from the Qur’an dotted around the diary for some spontaneous reflection and plenty of space for writing random thoughts and brilliant ideas as well as beautiful, high definition snaps of mosques from around the world. As a diary, it is very well set out, with enough space to write appointments for each day and a daily section for important tasks. If you are looking for a diary and have thought about trying to make your time more productive, then this is a great buy! At £13.99, I found simplyislam.com the best place to buy it from as they include free ayah cards and their delivery is super fast. Of course, this is only an aid to changing your lifestyle and kicking bad habits – if you buy the book, the change will only come if you utilise the tools it offers. I’ll check back in about a month to see how I’ve gotten on with using the diary!